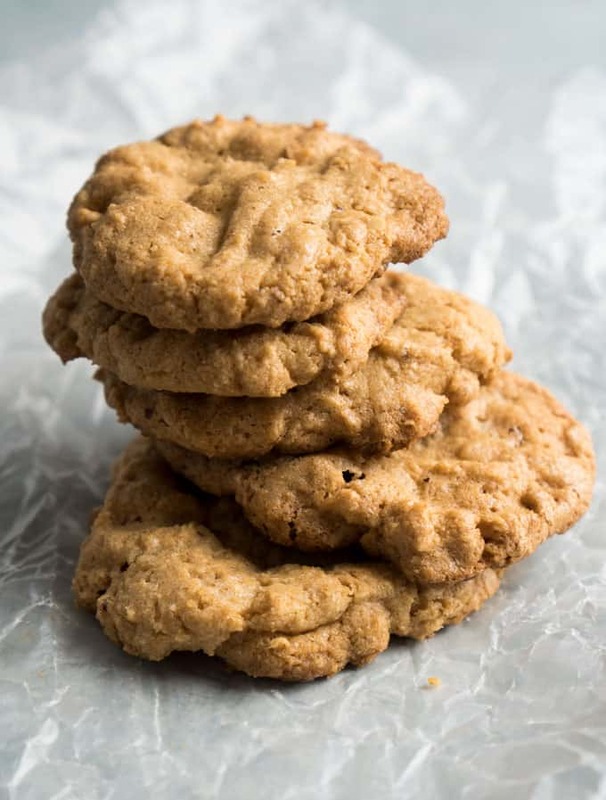 It doesn’t get much easier than this 4 ingredient recipe for gluten-free peanut butter cookies. I’m not sure if you’ve realized this, but I’m a little bit of a peanut butter fiend…I mean behind Oreos it’s my biggest craving! (I recently combined those two when I made those peanut butter dirt cake trifles, remember?!) So it’s crazy to me that I hadn’t yet shared this easy gluten free peanut butter cookies here on the blog before now! This is not only one of my favorite fast treats to make, but it’s also my go-to cookie recipe when making for my gluten-free family and friends. 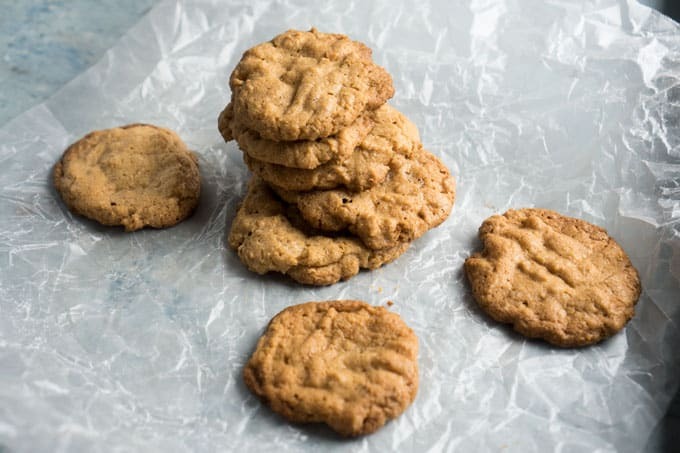 These peanut butter cookies are exactly the recipe you need when you get a crazy peanut butter craving because they only require 4 ingredients. I can almost guarantee you that you already have them all in your kitchen right now! And they cook up in just ten minutes so you can go from hungry to warm cookies in 15 minutes total. If you are gifting these cookies or super concerned about them looking “perfect” I recommend chilling the dough for about an hour and then rolling into balls before putting that classic fork crosshatch impression as they’ll have a little bit better-finished appearance. If its just taste you’re after don’t bother. Ready? Get your cookie on! *This post was updated with new pictures and video in October of 2018, originally published in August 2013. 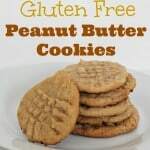 Easy, delicious gluten free peanut butter cookies! Use a cookie scoop or spoon to drop 1″ balls of dough onto a greased cookie sheet. If desired add the classic peanut butter cookie crosshatch by pressing a fork sprayed with nonstick spray into the top of each cookie. For “prettier” cookies refrigerate dough for one hour before scooping into balls. If you’re looking for easy cookie recipes, here are four more you might also like! Ohhhh, these could be SO dangerous! I always have those 4 ingredients on hand!! Me too Keri! They are sooo good, the entire batch disappears literally in hours! We LOVE these at our house! I haven’t made them in a bit… think I’ll have to get busy! I totally thought if you when writing the post Gwen-you’re my gluten free diva! You are a woman after my own heart, 4-ingredients, super easy, and gluten-free!! That’s my kinda recipe! I love peanut butter! I am a vegan and do not eat processed foods and cannot eat gluten. What can I use to replace the eggs? I have some unrefined sugar. Unsweetened apple sauce. 1/2 cup equals 1 egg. Love these! I also add some chocolate chips because you can’t go wrong with peanut butter and chocolate!! I made these with half the sugar called for and used coconut sugar – they are great! Can i use honey, stevia or agave in lieu of the sugar? These look great and sound perfect for coffee fellowship at church, etc. I don’t mean to complicate things, but do you use an all-natural type peanut butter or one of the popular creamy or chunky types ( no-stir)? I’m eager to try them no matter which type! I’m sure they will get raves. Thanks for sharing this easy gluten-free recipe. Our nanny made these today. She used less sugar (we will probably try honey next time) and added about 2/3-1 cup of oatmeal/gluten free oatmeal. I’m not a huge peanut butter fanatic (I crave it sometimes but my toddler and husband are crazy about it) and these were just right for me. Sweet but not too sweet and indulgent enough to satisfy a craving. Dangerous to keep in the house!